There's never enough thyme - what a great little plant for all sorts of garden uses aside from the culinary one. 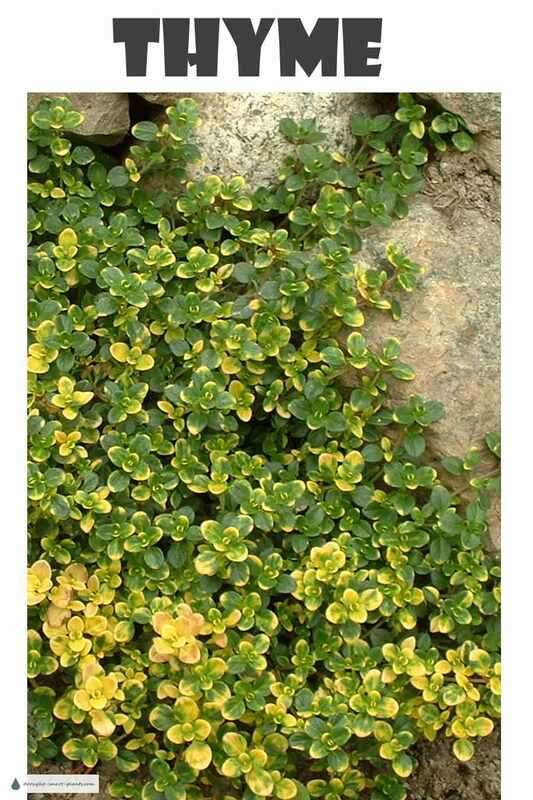 One of the best drought tolerant groundcovers for xeric gardens, thyme is hardy, adaptable and beautiful, as well as low maintenance. I grow many different kinds of thyme in my xeric garden - some are flat, not above three centimeters (an inch or so) tall, including the flower. These creeping red thyme varieties are perfect for patio planting and between paving stones in walkways. Others are more like a little shrub, and can be used for making tiny hedges in a miniature landscape or herb knot gardens. 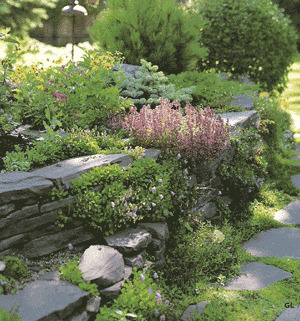 Draping a rock wall with thyme is a perfect way to soften the landscape and make it appear more established and romantic. What would a mediterranean garden be without thyme? All the thyme species and varieties drought tolerant, needing only minimal watering once established. Never plant thyme under eaves where they'll get dripped on or have ice form on them as this usually does them in. In the same vein, never use salt based de-icers on your thyme. Soil preparation is key to how to grow thyme successfully as it loves a fast draining soil. It can withstand a lot of drought, making it a perfect choice for a thyme lawn which not only uses much less water and fertilizer than the average grass lawn, it doesn't require mowing - ever. You may want to take off the dead flower heads once the thyme plants finish blooming, but that's the only care they need. You can't play football or other boisterous games on it, but croquet or other gentle use is fine. Put a couple of chairs and a table on your thyme lawn, enjoy the scent of the plants warmed by the sun (as of course, you will plant your thyme lawn in full sun!). Plant thyme amongst pavers to give your patio an aged look. 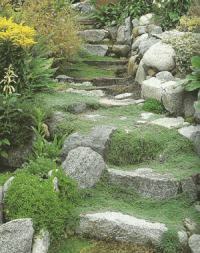 Stone steps obscured by a lush carpet of thyme invites visitors to explore further, possibly to a herb garden placed on a sunny knoll with a rustic stone seat (or a stool cushioned with thyme) surrounded by more scented herbs. How delightful that would be, if you could sit quietly and listen to the bees in the lavender, lamb's ears and yes, thyme blooms.